We needed a minibus for 8 people to take us to the airport at the last minute. 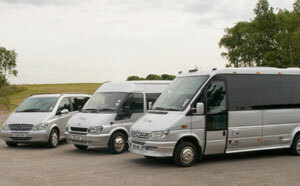 Hire-a-Minibus offered us a variety of options available to us. Our self-drive minibus was comfortable, clean and got us to the airport on time! A company that has more than thirty years of experience in European minibus hire services is certainly worth dealing with which is why it pays to deal with Tiger European. Tiger European is a European minibus hire company that is family owned and has over three decades of experience in this line. It began as a single minibus company in 1975 and has grown to become a European minibus hire company that owns sixteen vehicles including cars, coaches and minibuses. The company operates from its base in Colwick Industrial Estate in Nottingham and can provide solutions for national and local tours as well as for airport transfers. This European minibus hire company can supply various sized minibuses for hire including minibuses that can accommodate eight to seventeen passengers. These minibuses can be hired for self drive, with driver and can be driven in the UK as well as in Europe. Tiger European provides minibuses for hire for every occasion including short trips, airport transfers as well as for long distance travel. Each minibus is well maintained and is fitted with safety belts to ensure that you get to travel in complete safety. To know more about this European minibus hire company, simply make use of their online enquiry form or call the company on 01159 404040 or use their online email link to send them an email. It also offers minibuses for airport transfers and will transport your group to any resort or hotel. BM Coaches is a company that offers a suitable minibus for hire for travel in Europe. You can hire these minibuses to take you to different parts of Europe and for any occasion including football matches, rugby matches and also for holidaying in Europe. To contact this European minibus hire company you can call 0208 848 7711 and you can also email the company. If you want, you can also visit their office in person at Shackles Dock, Silverdale Road, Hayes, Middlesex UB3 3BN.